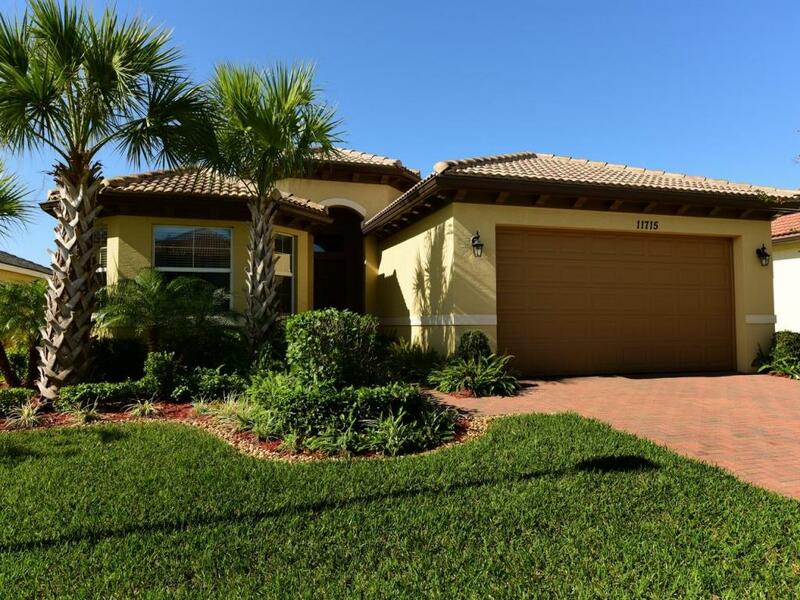 Living is easy in this beautiful Gulfstream model located in desirable Townpark community in Port Saint Lucie, Florida. With 2 bedroom, 2 bath plus den open floor plan you will enjoy this perfect home for relaxing and entertaining. The minute you walk in you feel as the designer just left and you are there to enjoy all the beauty. Foyer invites you with its airy feeling and sleek light fixture. Living room/formal dining makes you just want to sit there and admire its crisp contemporary style. Recessed lighting makes it bright and comfortable. Family room is perfect for entertaining as you can prepare meals in your stylish and modern kitchen while conversing with family or friends. All GE stainless steel appliances, thick granite counter tops, wooden cabinets and over sized pantry complete this functional space.Beautiful 18x18 porcelain floor tile makes the living area calm and cool. Breakfast corner is spacious enough to provide your guests with lots of comfort. Large sliders overlook beautifully landscaped yard with robelina and tiger tail palms that will provide lots of privacy. The covered paved patio creates your own little oasis to enjoy the warm Florida evenings. Master bedrooms is simply a retreat with its coffered ceiling, neutral colors and beautiful window treatments. New Avila laminate flooring just adds to this stunning look. Keep going past the two large walk-in closets and take a peak at the master bath with its huge glass shower, dual sinks and beautiful tile. Den has large double doors, gorgeous laminate flooring, beautifully toned colors and it can serve as an office or a third bedroom if desired. It is next to the 2nd bath and the guest bedroom which rest assured your guests will appreciate with its beautiful laminate floor, earth colors, stunning window treatments and ample closet space. The laundry room comes complete with GE Profile front load washer and dryer along with plenty of shelf and closet space. The two car garage has abundant storage and attic space. This home is perfect for full time living or a vacation spot. Ideally positioned within walking distance to great amenities (clubhouse, exercise room, pool, tennis courts, basketball court etc.) of Townpark and close proximity to the shopping center, restaurants, schools and entertainment. Lovely Home Just Listed In Tequesta! Jupiter Inlet Colony Home For Sale!